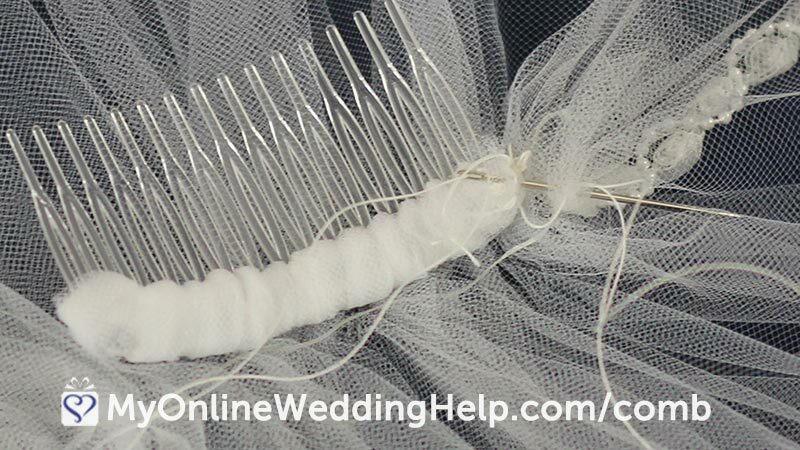 After you make your wedding veil (steps 1-4), the last step is to wrap and attach a comb. I’ve written text instructions below. You may also watch the video at the end of this post. There are other ways to attach your comb, but for me, this seems the most reliable. 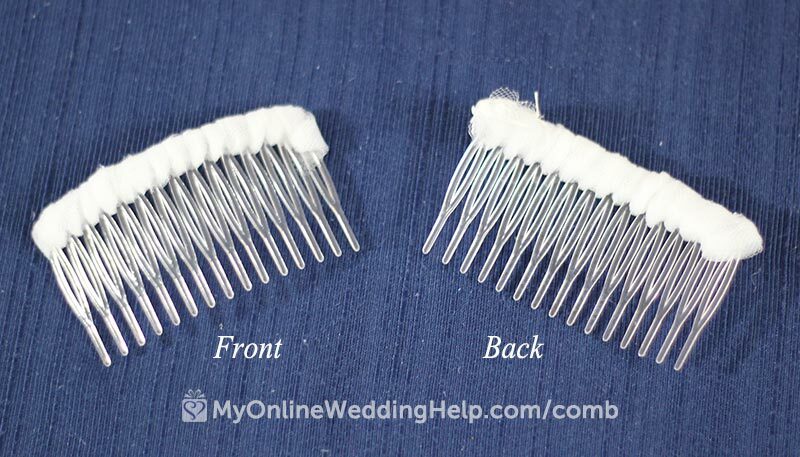 By securing the comb with thread you get a harder hold than if you use felt and glue. I also like the way the tulle looks on the front edge of the comb, which might be visible at some points. 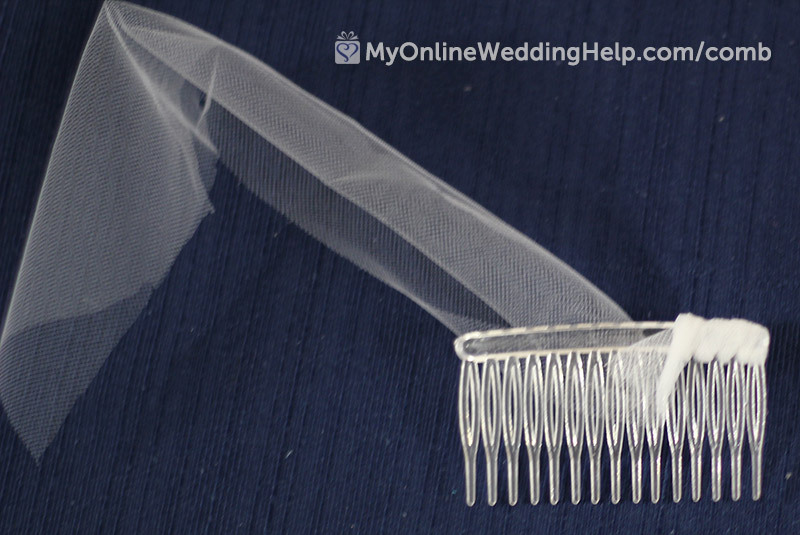 5.1 Twist the tulle into a strip that will fit between the teeth of the comb. 5.2 Begin by giving the twisted tulle a short “tail,” which you will secure as you wrap the teeth. 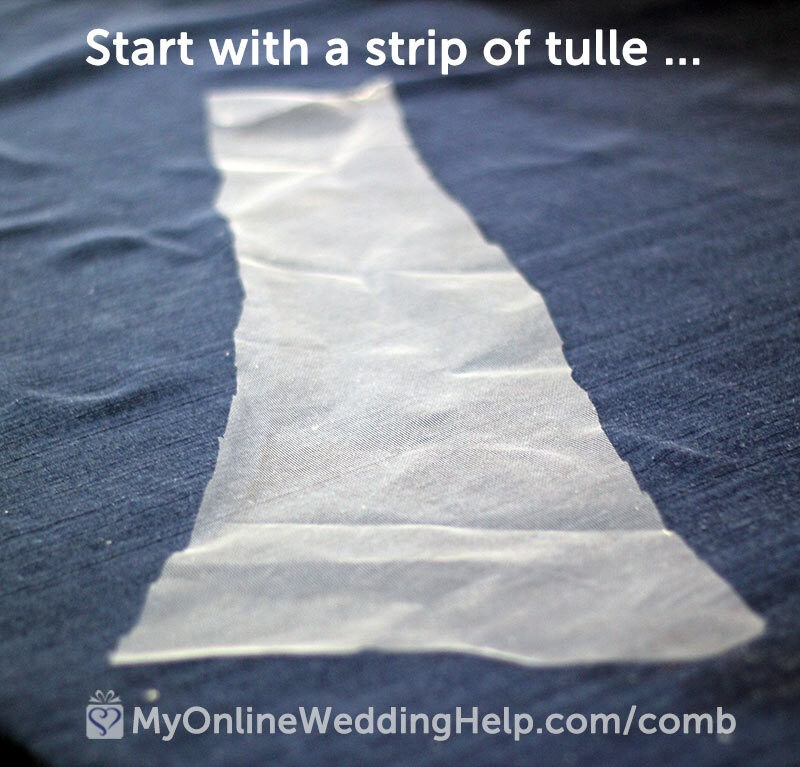 Then wrap the long end of the tulle between the first and second teeth and pull tight. 5.3 Continue wrapping through the second and third teeth, trapping the short tail against the base. Repeat this process until you reach the last tooth. 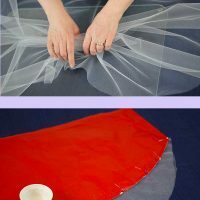 5.4 Cut off excess tulle. 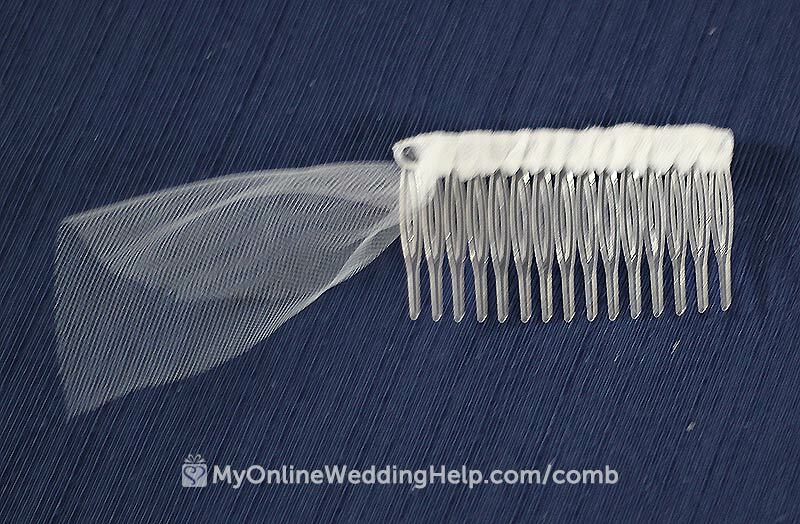 Glue or tack down the tulle at the end of your comb. 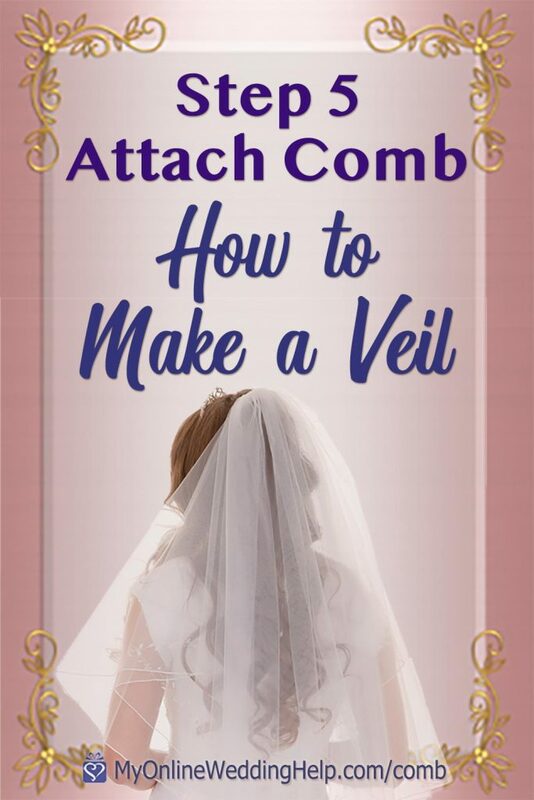 You are now going to attach the comb to your veil where the blusher turns into the veil section. 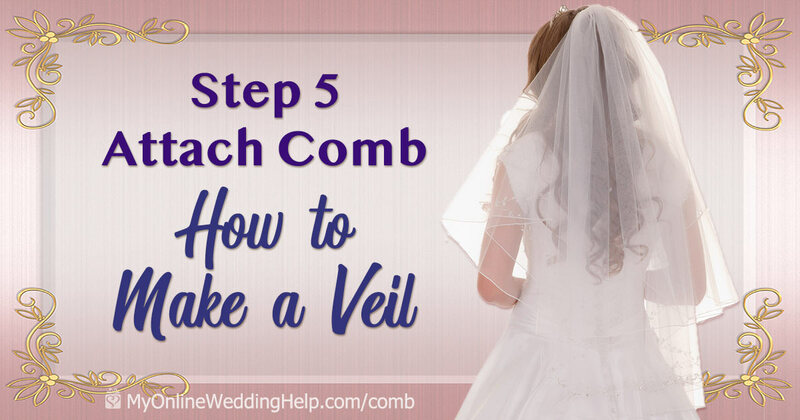 Before you begin, get familiar with the front/back orientation of your veil. 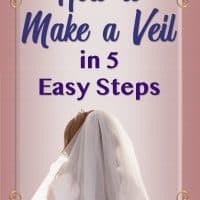 If your veil has trim, find where it ends along each edge. This is also where you created the gathers. 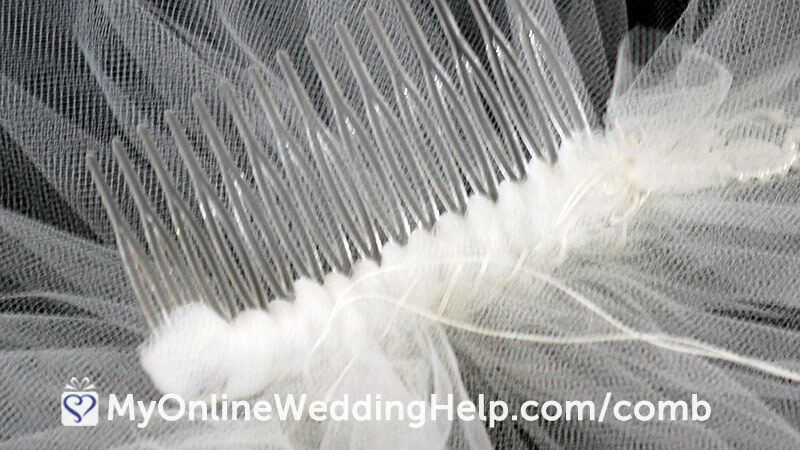 Notice which side is the underside of your veil. And turn the veil so your blusher is toward you, upside down. You should be looking at the backside of any trim or beading. Position the comb so, when on, the comb will curve toward your head with teeth pointing back. And the comb itself is between the blusher and the veil. 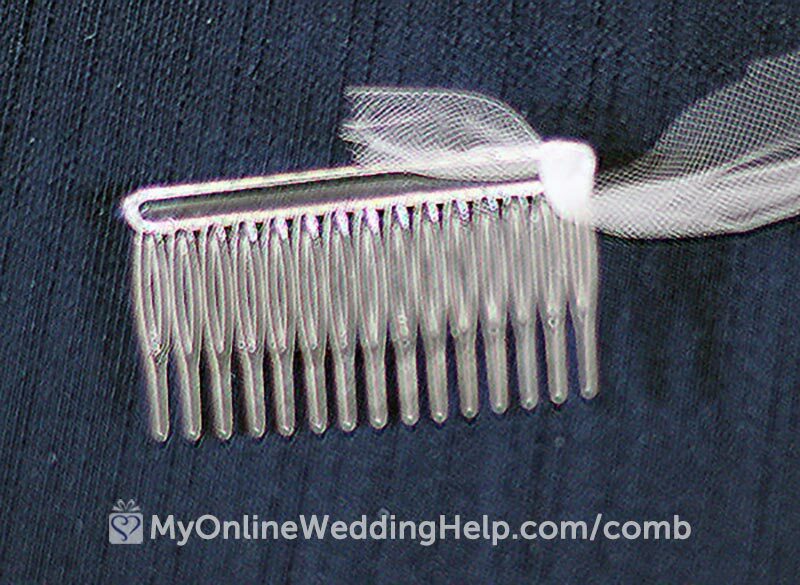 If you do not have a blusher, consider sewing on the comb so the veil will flip back over the comb base. This will hide the raw edges. 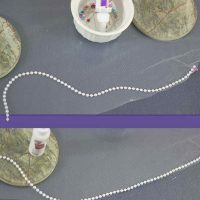 5.6 After the initial stitch, sew all the way across, catching your thread in the gathers. When you get to the end, tie off and knot the thread. Clip any stray threads. Also, rub out visible pencil marks, and smooth uneven edges so the veil looks polished. Congratulations, your veil with a comb is complete! There is one question you should ask yourself before deciding to tackle each DIY wedding project. Do you have the time, talent, and tenacity to make it to your liking? Because a wedding involves so many tasks, your time is precious. 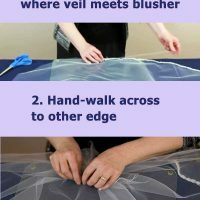 A simple, plain veil takes little time to make. But begin adding decorations and the commitment soars. If–after looking through the steps to making a veil–you decide it is not your cup of tea, no worries. All of the simple wedding veils here cost around $40 or less. 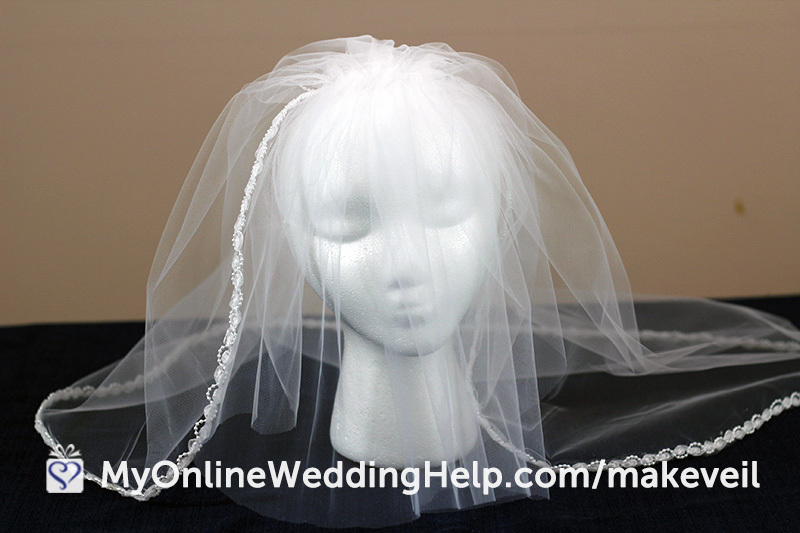 After factoring in the time it would take to make your own veil, you may decide to buy at a low price instead of DIY. How to attach the comb is step five in the tutorial. Here are the other four steps, along with the overview.